Trapped in a hidden fortress tucked between towering mountains and a frozen sea, Solveig, along with her brother the crown prince, their older sister, and an army of restless warriors, anxiously awaits news of her father's victory at battle. But as winter stretches on, and the unending ice refuses to break, terrible acts of treachery soon make it clear that a traitor lurks in their midst. A malevolent air begins to seep through the fortress walls, as a smothering claustrophobia slowly turns these prisoners of winter against one another. Those charged with protecting the king's children are all suspect, and the siblings must choose their allies wisely. But who can be trusted so far from their father's watchful eye? Can Solveig survive the long winter months and expose the traitor before he manages to destroy a kingdom? The king’s three children and a small group of warrior-protectors take refuge in a winter-bound steading on a northern fjord and discover there’s a traitor in their midst. Beautiful Asa, the eldest princess, faces an arranged marriage, although she loves another. Harald, the youngest, will one day be king. But the narrator, middle daughter Solveig, is neither attractive nor particularly useful, until she begins to realize she has talent as a storyteller and could have a future as a skald, or court bard. 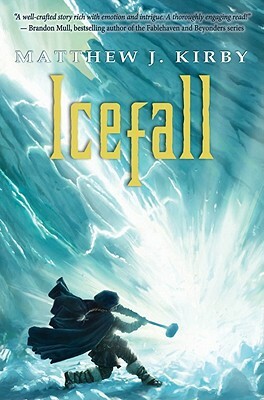 As food runs low and bitter winter tightens its hold, someone in the group begins to sabotage the remaining supplies, and Solveig has a dream that foretells a tragic end to their efforts to survive. Interesting, well-developed characters abound, and Solveig’s strong narrative voice adds authenticity as she grows into her new role, not just telling stories of the mythical Scandinavian past but creating tales to alter the behavior of those around her. Valid clues and occasional red herrings heighten the sense of mystery. The chilly, claustrophobic, ancient setting is vividly created, and the sense of impending doom generates a gripping suspense overarching the developing—and deteriorating—relationships among the group, marking Kirby (The Clockwork Three, 2010) as a strong emerging novelist.